1996 Fadal VMC4020 mdl. 906-1 CNC Vertical Machining Center s/n 9606762 w/ Fadal CNC88HS Controls, 30-Station ATC, CAT-40 Taper Spindle, 10,000 RPM, 28” Extended “Z” Axis, 422k Memory Expansion, Servo Coolant Control, Rigid Tapping, Spray Mist, 4th-Axis Prewire, Coolant. 1995 Fadal VMC4020HT mdl. 906-1 CNC Vertical Machining Center s/n 9504740 w/ Fadal CNC88HS Controls, 21-Station ATC, CAT-40 Taper Spindle, 10,000 RPM, High Speed CPU, Graphics, Memory Expansion Card, 4th-Axis Prewire, Coolant. 1994 Fadal VMC3016 mdl. 904 CNC Vertical Machining Center s/n 9403016 w/ Fadal CNC88HS Controls, 21-Station ATC, CAT-40 Taper Spindle, 10,000 RPM, High Speed CPU, Graphics, 4th-Axis Prewire, Coolant. 1996 Fadal VMC3016 mdl. 904-1 CNC Vertical Machining Center s/n 9611752 w/ Fadal CNC88HS Controls, 21-Station ATC, CAT-40 Taper Spindle, 10,000 RPM, 422k Memory Expansion, High Speed CPU, Graphics, Rigid Tapping, 4th-Axis Prewire, Coolant. Hurco mdl. KM3 3-Axis CNC Vertical Mill s/n 8001018E w/ Hurco KM3 Ultimax Controls, 60-4000 Dial Change RPM, Kwik-Switch Spindle and Tooling. 1996 Daewoo Puma 8S CNC Turning Center s/n PM8S-0778 w/ Mitsubishi Controls, Tool Presetter, 12- Station Turret, Hydraulic Tailstock, 8” 3-Jaw Chuck, 16C Collet Nose, Chip Conveyor. Hardinge / Fagor Retrofit CNC Cross Slide Lathe w/ Fagor Automation CNC Controls, 5” x 12” Cross Slide Table, 5C Pneumatic Collet Closer. Clausing-Colchester-15 15” x 54” Geared Head Lathe s/n 6/0015/19903 w/ 25-2000 RPM, Inch/Metric Threading, Tailstock, Trava-Dial, Aloris Tool Post, 10” 3-Jaw Chuck, 5C Collet Closer. Hardinge mdl. 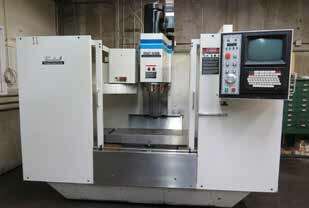 HC Hand Chucker s/n HC-5937-T w/ Threading Attachment, 125-3000 RPM, 8-Station Turret, Power Feeds, 5C Collet Closer. Hardinge mdl. DV-59/DSM-59 Second Op Lathe s/n DV-59-17867 w/ 230-3500 RPM, 6-Station Turret, Cross Slide, Cutoff Attachment, 5C Collet Closer. Dake MEP Electronic Tiger 350AX 14” Automatic Miter Cutoff Saw w/ Tiger Controls. Pehaka 40” Vertical Band Saw w/ Blade Welder, 6000 Max Dial FPM. Kalamazoo mdl. CS12 10” Miter Cold Saw s/n 150174. Craftsman 10” Radial Arm Saw. Kaeser Sigma Profile SK18 15Hp Rotary Air Compressor s/n 185905 w/ 68 CFM @ 110 PSIG, 29,300 Hours. Kaeser KRD75 Refrigerated Air Dryer. 240 and 120 Gallon Air Storage Tanks. Darex mdl. E-90 Endmill Sharpener w/ 5C Air Fixture. Craftsman and Power Kraft Bench Grinders. Boice mdl. 24801 Geared Head Power Drill s/n 626120 w/ 105-1740 RPM. Burgmaster 6-Station Turret Drill Press. (2)Abrasive Finishing and Hutson “Burr-Bench” Media Tumblers. Almco Bowl Style Media Tumbler. Miller MIllermatic 175 230 Volt Wire Welder s/n LE062584. Lincoln AC180 Arc Welding Power Source. Aboytes Dry Blast Cabinet w/ Dust Collector. Haas 4th-Axis 5C Rotary Indexer w/ Servo Controller. 5C Indexing Head, Spin Fixture and Collet Closers. 8” x 12” Sine Table. Renishaw MIP Probe Head, SoftMic Controls, 39” x 43” Granite Table. Mitutoyo 0-12” and 6”-12” OD Mic Sets. Tesa 1”-2”, 0-1” Thread Pitch Mics. Mitutoyo 1”-2”, 0-1” Indicating OD Mics. Sunnen .495”-.75” Dial Bore Gage. Mitutoyo V-Blocks and 1-2-3 Blocks. Starrett Crystal Pink 24” x 36” x 6” Granite Surface Plate w/ Stand. 36” x 42” x 6” Granite Surface Plate. 12” x 18” x 4” Granite Surface Plate. Toyota mdl. 40-3FGC25 5000 Lb. Cap LPG Forklift s/n 40-3FGC25-10019 w/ 2-Stage Tall Mast, 130” Lift Height, Solid Tires. Misc Raw Materials Including Aluminum and Stainless Bar and Plate Stock.